Willi Mac's unique compositions reflect his eclectic tastes and widely varied influences culminating in a genre all its own. Co‐wrote, performed and produced hundreds of music tracks. Released on his own 3Eight Entertainment label, “Instrumental Moodz” promises a brand new vibe… blending the best of all musical worlds. 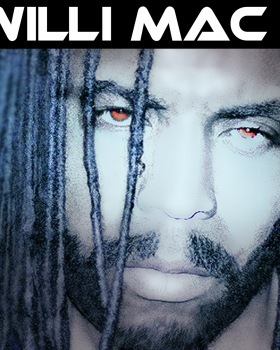 Willi Mac and Chopmaster J formed Big Brutha Soul & The Bros. of Invention, a 13‐piece powerhouse funk band performing live in Bay Area venues and across the U.S.
Co‐produced tracks featuring guest appearances by George Clinton, El Debarge, Dave Hollister and others. Toured the US and abroad and shared stages with the late Rick James, Morris Day & The Time, Todd Rundgren, Jimmy Page, Sheila E, The P‐funk All‐stars and Mick Fleetwood to name a few. In the early 90’s worked with multi‐platinum rap group Digital Underground co‐founder Chopmaster J and R&B vocalist Dave Hollister (collectively as Force One Network). Willi Mac co‐wrote, performed on and produced much of the group’s critically acclaimed debut album The M.M.E. – Program I for Quincy Jones’ Qwest / Warner Bros. label. Co‐wrote and co‐produced the Force One track “Static” which featured 2Pac. Force One Network also placed the song “Spirit” from the ‘M.M.E.’ album in the film and on the million plus selling soundtrack for John Singleton’s Oscar Nominated “Boyz ‘N The Hood”.